The Creative Campus Tour is your introduction to the fine arts on the University of Wisconsin–Madison campus! You will learn about the various arts areas available for study as we visit the spaces where students create and perform. Additionally, prospective and admitted students will visit the creative arts learning community in Sellery Hall, also known as The Studio. This energetic and highly entertaining walking tour led by a student tour guide will show you how you can be part of the arts at UW–Madison story. The Creative Campus Tour is open to everyone – prospective, admitted, and incoming students as well as anyone interested in learning more about arts offerings on campus. The tour lasts two hours and is recommended for ages 12+. The route includes stairs and hills. Please share special needs and requests for accommodations two weeks in advance of your visit. Dress for the weather and wear comfortable shoes. Parking near Nancy Nicholas Hall include Lot 17, Lot 20, Lot 27, and Lot 80. Read tips for parking on campus here. 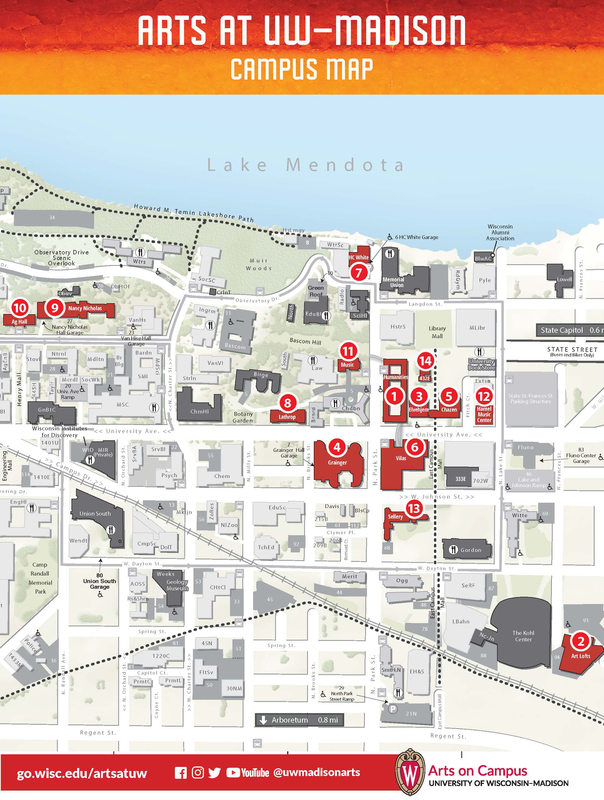 Download the Arts at UW–Madison Campus Map (PDF). Note: the material covered on this tour is different from the daily information session and campus walking tour led by the Office of Admissions and Recruitment. We encourage you to take both tours if time permits. The Creative Campus Tour is presented by the Division of the Arts in partnership with Campus and Visitor Relations and the Office of Admissions and Recruitment. Additional support provided by the Office of the Provost and the Anonymous Fund. Other campus partners include the Art, Dance, and Design Studies Departments, the Center for Design and Material Culture, the Chazen Museum of Art, the Department of Theatre and Drama, the Mead Witter School of Music, The Studio Creative Arts Community, and the Wisconsin Union.